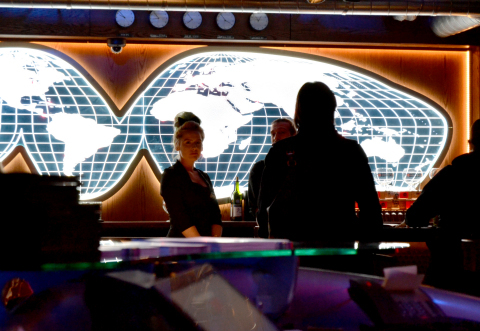 On orders from Control, SafeHouse agents will neither confirm nor deny that legendary Milwaukee destination (and famous spy refuge), The SafeHouse, will officially open its covert Windy City location to the public on March 1 at 5 p.m. However, reliable sources have reported this to be factual. SafeHouse Chicago, a refuge for weary spies, maintains the establishment's treasured 50-year legacy while adding upgraded experiences to the new location, including new technology and a modern design by Chicago's own award-winning firm, The Gettys Group. On orders from Control, Station Chief Agent OH-OH-7 (aka David J. Baldwin) founded SafeHouse Milwaukee in 1966. His vision for this spy-themed hideaway was unique and full of historical references. SafeHouse became a local landmark and cultural icon for hungry spies. Agent OH-OH-7 and his Chief of Disinformation Agent Eliza remained undercover for nearly 50 years. Their secret was service for all spies who came in from the cold - or from the warm. Today, Agent BB (aka Greg Marcus, The Marcus Corporation President and CEO), and his team of friendly Marcus Restaurant agents continue Agent OH-OH-7's vision. "Who doesn't want to escape the everyday for an hour or two and become an international superspy?" says Agent BB, Greg Marcus, President and CEO of The Marcus Corporation. "Fascination with the world of espionage persists in novels and movies, making the SafeHouse concept one that stands the test of time. Spying is, after all, the world's second oldest profession." Secretly headquartered below the city streets in the vicinity of 60 E. Ontario Street, the SafeHouse Chicago fuses elements from the original Milwaukee location with modern technology. The password to enter will remain unchanged, but a new agent authentication process and unique new experiences have been installed, including the soon-to-be infamous Cone of Silence Booth. Visiting spies will be tasked with locating the top-secret entrance marked only with a sign for International Exports Ltd. flanked by a gaslight and an iconic red door. Before entering, operatives will be required to provide the password or perform a top-secret clearance test to gain entry to this newest refuge for spies from around the world. Once inside, operatives will embark on a one-of-a-kind mission as they create their own agent name and complete missions while discovering gadgets and uncovering hidden secrets. In addition to upgraded technology, the SafeHouse Chicago integrates more technology and upgraded aesthetics for agents operating in the modern world. The design of the SafeHouse was led by award-winning design firm, The Gettys Group, and Agent Fudd, Paul Daurio. Original espionage artifacts are an integral part of the décor, including the flight deck from an authentic spy plane donated by the man who flew it in WWII, as well as a piece of the Berlin Wall secured from covert operatives. From the sleek Interpol Bar to the Spybrary, to the Seduction Lounge and the Interrogation Room, every aspect of the design has been tinkered, tailored, soldiered, and spied. Interactive elements such as a Gadget Bar featuring a nightly magician, and "futuristic" technology, fuse seamlessly in an action-packed atmosphere where food and signature drinks unite guests as they embark on their mission. Every spy needs to eat well. Under orders from Control, the SafeHouse culinary agents are always on the prowl, tracing the source of local ingredients and securing them from top suppliers. These ingredients are then smuggled into the SafeHouse and hand-assembled into fresh dishes by experienced chefs to spies who deserve local and authentic food. Honoring original favorites like the Fried C4 Cheese Curds and the hand-crafted M.O.A.B. (Mother of All Burgers), Agent Pickles (a.k.a. Head Culinary Agent David Hardy) has bulked up the menu for visiting spies, adding specialties including our Camp X Poutine and an array of savory entrees as well as healthy vegetarian and vegan items. "Today's consumers are increasingly seeking unique experiences, and the SafeHouse is a one-of-a-kind restaurant and bar that fills that niche," says Agent Blonde, Peggy Williams-Smith, Marcus Hotels & Resorts Senior Vice President. "Spies in the great city of Chicago were in need of a refuge and Control wanted to ensure there was a SafeHouse for them as well." SafeHouse Chicago is open Sunday-Friday 11:00 a.m. to 2:00 a.m. and Saturday from 11:00 a.m. to 3:00 a.m. For more information on The SafeHouse, visit www.SafeHouseChicago.com or call (312) 3131-007. Marcus Hotels & Resorts, a division of The Marcus Corporation (NYSE: MCS), owns and/or manages 18 hotels, resorts and other properties in the U.S. The company's distinctive portfolio includes city-center meeting hotels, upscale resorts, historic properties, and premium branded and independent first-class hotels. Marcus Hotels & Resorts is an approved operator for all major lodging brands. A leader in the hospitality industry since 1962, Marcus Hotels & Resorts creates asset value for hotel owners through its expertise in management, development and product repositioning, including hotel food and beverage concepts developed by its Marcus Restaurant Group, including Mason Street Grill, ChopHouse and Miller Time Pub & Grill. The company is also growing its experiential restaurant concept, The SafeHouse, with a Chicago location opening in early 2017. For more information, please visit: http://media.marcushotels.com and follow the company on Facebook and Twitter (@MarcusHotels). Headquartered in Milwaukee, Wisconsin, The Marcus Corporation is a leader in the lodging and entertainment industries, with significant company-owned real estate assets. In addition to its Marcus Hotels & Resorts division, the company's movie theatre division, Marcus Theatres®, is the fourth largest theatre circuit in the U.S. and currently owns or operates 885 screens at 68 locations in eight states. For more information, please visit the company's website at www.marcuscorp.com .